By the time your toddler is ready to apply for college, being able to speak a foreign language will be très imporant. Help get your tot started by incorporating other languages into their nursery decor or playtime. Art and Philanthropy's Global Child Collection features an array of 100% recycled card stock wall cards and posters in Spanish, French, Italian, Hebrew, German and Swedish. Beyond being 100% recycled and printed with soy inks, each image in the artwork was originally created using scrap papers to make collages. We love both the eco-friendliness of this method and also the unique and imaginative look it gives the collection. 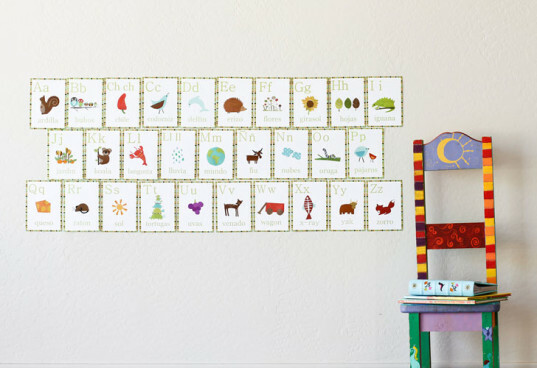 Throughout the six languages available, you’ll find nature themed counting cards, vintage farm animal wall cards, alphabet wall cards, a nature themed numbers poster, an alphabet poster and a compassion poster. The 5×7 wall cards are beautiful enough to frame and hang, but could also be used as flash cards. Even hanging on the wall, you can use the artwork as a teaching tool, asking your child to name each of the objects in English and Italian, or whatever language you choose. You could make going over the cards part of the bedtime routine, or an afternoon tradition. Even if you can’t speak a foreign language, you can learn along with your child using a simple Google search to confirm the correct pronunciations. The only problem with Art and Philanthropy’s foreign language offerings? You may get addicted to adding to your collection and building upon your child’s language skills, but that may just as well be buona! Beyond being 100% recycled and printed with soy inks, each image in the artwork was originally created using scrap papers to make collages. We love both the eco-friendliness of this method and also the unique and imaginative look it gives the collection. 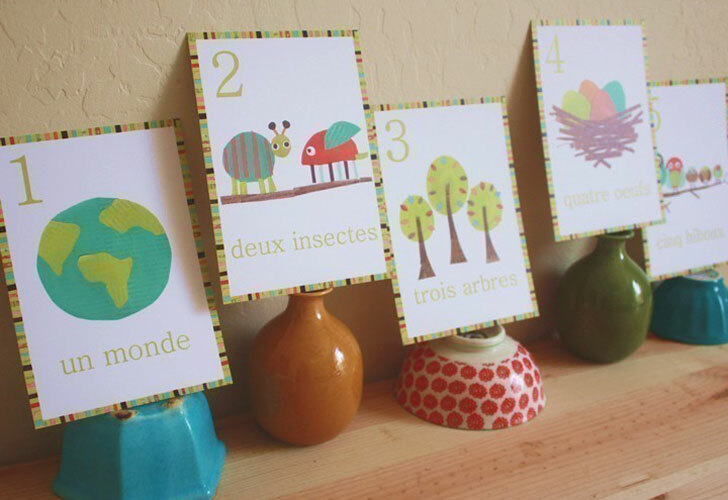 Throughout the six languages available, you'll find nature themed counting cards, vintage farm animal wall cards, alphabet wall cards, a nature themed numbers poster, an alphabet poster and a compassion poster. The 5x7 wall cards are beautiful enough to frame and hang, but could also be used as flash cards. Even hanging on the wall, you can use the artwork as a teaching tool, asking your child to name each of the objects in English and Italian, or whatever language you choose. You could make going over the cards or poster part of the bedtime routine, or an afternoon tradition. Even if you can't speak a foreign language, you can learn along with your child using a simple Google search to confirm the correct pronunciations. The only problem with Art and Philanthropy's foreign language offerings? You may get addicted to adding to your collection and building upon your child's language skills, but that may just as well be buona!